CWP Renewables and Partners Group are proud to be pioneering Australia’s first, large-scale, public, community investment into a utility-scale wind farm. The Sapphire Wind Farm Community Co-investment allows members of the local community to invest in the Sapphire Wind Farm. CWP Renewables and Partners Group (a global private markets investment management firm which is also the majority equity investor in the Sapphire Wind Farm) seek to share the benefits of their wind, solar and battery projects with the local communities which host these projects. CWP and Partners Group are pleased to partner with DomaCom on this innovative project. 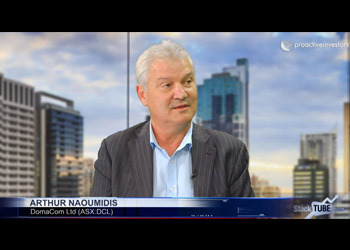 DomaCom has developed an online ‘fractional investment’ platform for retail investments, which has been adapted for the Sapphire Wind Farm Community Co-Investment. The Sapphire Wind Farm is located in the New England region of northern NSW, 28km east of Inverell and 18km west of Glen Innes. At 270MW it is the largest wind farm in New South Wales. 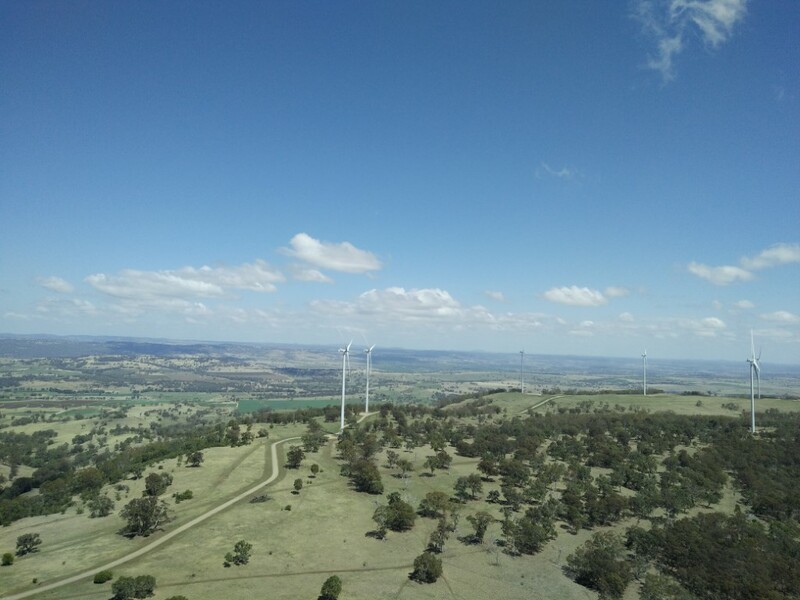 100MW of the project’s output is helping the ACT Government to meet its target of 100% renewables by 2020, and further project output has been contracted to the Commonwealth Bank of Australia. The project commenced construction in December 2016 and was commissioned in November 2018. 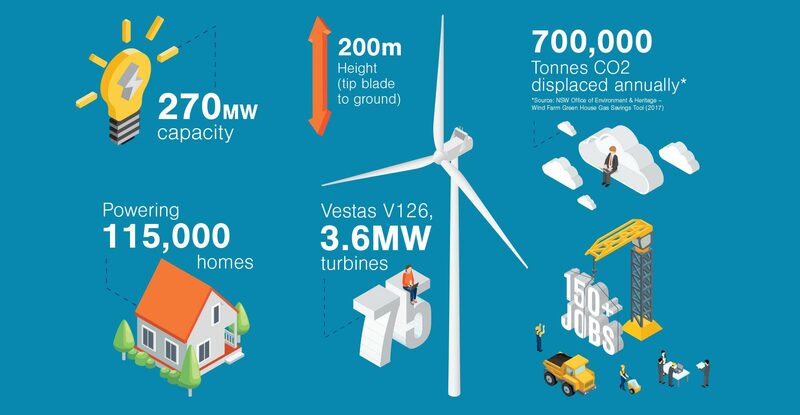 The energy generated by the Sapphire Wind Farm is enough to power around 115,000 homes and to displace 700,000 tonnes of carbon dioxide each year. Over $7.4m of pledges have been made by community members interested in investing throughout 2017/2018. Due to this overwhelming interest, CWP and Partners Group are pleased to be delivering on their promise to the community, to open up the project for co-investment. The first step to being part of the opportunity is to register your interest here. If you have an eligible postcode then you will be immediately sent an application form. This is a first-come-first-served opportunity which is only open to residents located in the Federal Division of New England. Priority will be given to wind farm neighbours and residents of the Inverell and Glen Innes Shires. The formal Supplementary Product Disclosure Statement (SPDS) will be available in February 2019. You will need to view this and approve your investment once it is released. The investment opportunity will remain open until the end of March 2019. To ensure Investors are aware of the investment risks, we have stated below several of the risks that are relevant to an investment in this Sub-Fund. Underlying Asset not acquired – If there is insufficient investor interest to obtain the minimum aggregate investment of $3.5 million, the Sapphire Wind Farm Community Co-Investment may not proceed. Investors who have placed cash on the platform will have their funds released. (after expenses if applicable). No guarantee – Returns are not guaranteed and Investors may lose some or all of their capital. The Underlying Asset is an unsecured loan offered by Grassroots Renewable Energy (a joint venture between CWP Renewables and Partners Group) and therefore ranks below other secured creditors such as Bank Lenders, but before equity shareholders in Sapphire Wind Farm. Liquidity risk – There is a risk that an Investor cannot withdraw from the Sub-Fund until the Sub-Fund is terminated, and the Underlying Asset is sold. However, DomaCom does intend to offer a facility through which Investors can seek to sell their Units to another party and will promote available units to existing shareholders and via the Sapphire Wind Farm e-newsletter list. However, there is no guarantee of another investor purchasing the units being offered for sale. Financial Risk and inability to service the loan and pay out the Loan on maturity – There is a risk that CWP Renewables and their partners may find themselves in financial difficulty and are not be able to meet their commitments with regard to the terms of the Unsecured Loan. This is a very small risk given that a significant amount of the Sapphire Wind Farm’s output has been sold under long-term contracts to the ACT Government and the Commonwealth Bank of Australia and the remainder of its generation will be sold on the spot electricity market. Damage or loss– There is a range of events that can damage the Sapphire Wind Farm including acts of God (fire, flood, earthquake and other natural disasters) through to accidents, negligence, and failures of maintenance. This could in turn place pressure on CWP Renewable and Partners Group to perform financially and thus place a risk on the company meeting its commitments under the terms of the Unsecured Loan. 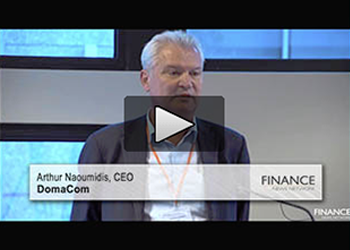 DomaCom’s fee will be paid by CWP Renewables and Partners Group and there will be no charge to the Investors. During the Campaign, DomaCom has incurred the expenses such as legal review of the agreement and due diligence costs reviewing the underlying asset. The Campaign costs whether the campaign succeeds or fails will be paid for by CWP Renewables and Partners Group and not paid by the community investors.